Just in time for the holiday giving, the latest timepiece from Jorg Gray will be hitting stores and it looks like a winner. 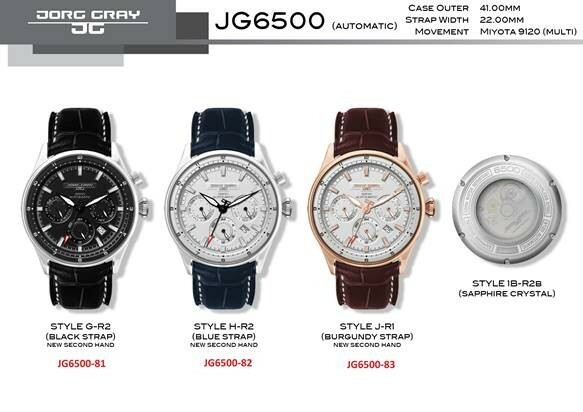 The JG6500 Automatic was recently previewed at JCK Las Vegas and features a Miyota 9120 multifunction automatic movement with 40 hours of reserve power. This new model has a solid 316L stainless steel case with an anti-reflective flat sapphire crystal. This stylish timepiece comes with a not-so-luxurious price tag of just $895. If you’ve run across a website that offers unbelievable deals on luxury items like Swiss watches and designer bags, better beware because those deals may not be as good as they sound. The Internet is full of sites selling counterfeit goods, but Italian police have just staged a huge crackdown on these bogus sellers. Reuters reports that the Italian police have shut down 410 sites that were raking in big cash by pushing fake Prada handbags and Patek Philippe watches. This is good news for legitimate retailers in Italy, which have taken a huge hit from the trade in counterfeit goods. Just a few years ago a buyer had few choices when it came to buying Apple Products. Your color options tended to be stainless steel or a neutral like black. Nowadays, Apple is offering a much wider palette including gold. Why has Apple suddenly become so eager to coat their products in molten gold (or a reasonable facsimile)? The answer is the Chinese market, which has a distinct preference for golden hues, and Apple CEO Tim Cook recently told Bloomberg Businessweek that the company was definitely taking the country’s tastes seriously. That’s because earlier this year, China surpassed Europe to become the second-largest market for Apple products. Within the next two years, Apple will be doubling its number of retail stores from 15 to 40. What’s more, the 18K gold Apple Watch Edition sold out instantly when it went on sale in China. That means we can expect more golden Apple Watch models, iPhones, iPads and other Apple products in the future—unless the Chinese change their tastes.